Kana Hanazawa (花澤 香菜, Hanazawa Kana, born February 25, 1989) is a Japanese voice actress and singer represented by the Office Osawa talent agency. She is known for voice acting leading roles for a number of anime television series and other anime-related media in Japan, including Nadeko Sengoku in Monogatari, Anri Sonohara in Durarara! !, Angel / Kanade Tachibana in Angel Beats!, Kuroneko / Ruri Gokō in Oreimo, Mayuri Shiina in Steins;Gate, Akane Tsunemori in Psycho-Pass, Natsume Tsuchimikado in Tokyo Ravens, Kosaki Onodera in Nisekoi, Rize Kamishiro in Tokyo Ghoul, Hinata Kawamoto in March Comes in Like a Lion, Shirase Kobuchizawa in A Place Further than the Universe, Ichika Nakano in Quintessential Quintuplets, and Raphiel Ainsworth Shiraha in Gabriel Dropout. Her debut single, "Hoshizora Destination" (星空☆ディスティネーション), was released on April 25, 2012 under the Aniplex/Sony Music Entertainment Japan label. Hanazawa began acting when she was in kindergarten. She made regular appearances at the variety program Yappari Sanma Daisensei. At the age of 14, she made her voice acting debut as Holly in Last Exile. Three years later, she played Ryoko Kaminagi in Zegapain. She then signed up with voice acting agency Office Osawa. 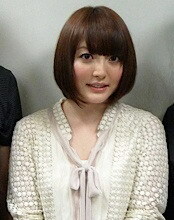 Hanazawa went to university in 2007, while at the same time, she began to make her mark as a voice actress. She voiced the title character in Kobato., Suou in Darker than Black: Gemini of the Meteor, Nadeko Sengoku in Bakemonogatari, Angel / Kanade Tachibana in Angel Beats, and Anri Sonohara in Durarara!!. She was voted in 2010 as "Best Female Voice Actress" by listeners of the radio program Nonko and Nobita's Anime Scramble (ノン子とのび太のアニメスクランブル). She graduated from university in 2011, and in the same year became a full-time voice actress. In late 2010, she was invited to the Anime Festival Asia anime convention in Singapore. On February 23, 2012, it was announced that Hanazawa would launch her official website. A few days later, during the "Kana Hanazawa Solo Debut Presentation Party event", it was announced that she would release four singles within a year: "Hoshizora Destination" (星空☆ディスティネーション) released on April 25, "Hatsukoi no Oto" (初恋ノオト), released on July 18, "Happy Endings", released on October 24 and was used as ending theme for anime Zetsuen no Tempest, and "Silent Snow", released on January 16, 2013. Her first album Claire was released on February 20, 2013, and her second album 25 was released on February 26, 2014. She released the album Blue Avenue in April 2015, and went on a concert tour starting at the Nippon Budokan on May 3. Her Blu-ray of the show, Live Avenue Kana Hanazawa in Budokan, ranked number six in sales. In 2015, she won Best Supporting Actress at the 9th Seiyu Awards. She later won Newtype's Best Voice Actress award. Hanazawa starred in her first live-action feature film Kimi ga Inakucha Dame Nanda (君がいなくちゃだめなんだ, It's Definitely No Good You're Not Here) Her video would later place tenth in Oricon's Blu-ray Disc Chart. Hanazawa moved to the Sacra Music record label under Sony Music Entertainment Japan in April 2017. "The Sound of First Love"
"A Person Loved in the Spring Is Who I Long to Be"
^ a b Doi, Hitoshi (May 5, 2016). "Hanazawa Kana (花澤香菜)". Hitoshi Doi's Seiyuu Database. Retrieved May 5, 2016. ^ a b c d e f g Nakagami, Yoshikatsu; Yoshida, Moichi; Nishimoto, Keiko (November 2007). "Voice Actress Spotlight – Kana Hanazawa". Newtype USA. Vol. 6 no. 11. pp. 144–145. ISSN 1541-4817. ^ a b c d e f g "花澤　香菜 - 俳優、声優、ナレーター、DJ、タレントの株式会社大沢事務所". Office Osawa (in Japanese). Retrieved November 3, 2015. ^ "Hoshizora Destination". Retrieved April 9, 2013. ^ "Toyota Wishes Kana Hanazawa A Happy Birthday". Crunchyroll. Retrieved 2018-10-22. ^ ゼーガペイン　ファイルサルベージ (in Japanese). ISBN 978-4-7753-0852-3. ^ "Kobato. - Resurrected Anime Review - The Otaku's Study". otakustudy.com. May 29, 2015. Retrieved August 4, 2017. ^ a b "AFAX/An angelic voice that will melt your heart away!". Archived from the original on September 14, 2010. Retrieved November 17, 2014. ^ "ノン子とのび太のアニメスクランブル: 第１０２７回 １２月１９日放送分、アニメグランプリ２０１０発表！前編" (in Japanese). December 26, 2010. Retrieved November 17, 2014. ^ "星空☆ディスティネーション" ["Hoshizora Destination"]. Oricon (in Japanese). 2012-04-25. Retrieved 2018-09-25. ^ "初恋ノオト" ["Hatsukoi no Oto"]. Oricon (in Japanese). 2012-07-18. Retrieved 2018-09-25. ^ ""Happy Endings"". Oricon (in Japanese). 2012-10-24. Retrieved 2018-09-25. ^ ""Silent Snow"". Oricon (in Japanese). 2013-01-16. Retrieved 2018-09-25. ^ a b "「ｃｌａｉｒｅ」 花澤香菜│オリコン芸能人事典-ORICON STYLE" (in Japanese). Oricon. Retrieved March 8, 2014. ^ a b "「２５」 花澤香菜│オリコン芸能人事典-ORICON STYLE" (in Japanese). Oricon. Retrieved March 8, 2014. ^ Matcha. "Kana Hanazawa's First Budokan Performance - MATCHA - Japan Travel Web Magazine". MATCHA – Japan Travel Web Magazine. Retrieved May 7, 2016. ^ "Kana Hanazawa Holds 1st Budōkan Solo Concert". Anime News Network. Retrieved May 7, 2016. ^ "Japan's Animation Blu-ray Disc Ranking, November 2–8". Anime News Network. Retrieved May 7, 2016. ^ a b c d "Sayaka Kanda, Daisuke Ono Win 9th Annual Seiyū Awards". Anime News Network. March 6, 2015. Retrieved May 6, 2016. ^ a b c "Fate/Stay Night, Psycho-Pass Film Win Top Newtype Awards". Anime News Network. October 10, 2015. Retrieved May 7, 2016. ^ a b "Voice Actress Kana Hanazawa Stars in Her 1st Live-Action Feature". Anime News Network. January 22, 2015. Retrieved May 6, 2016. ^ a b "Japan's Animation Blu-ray Disc Ranking, June 1–7". Anime News Network. Retrieved May 7, 2016. ^ a b c d e f g h i j k l m n o p q r s t u v w x y z aa ab ac ad ae af ag ah ai aj ak al am an ao ap aq ar as at au av aw ax ay az ba bb bc bd be bf bg bh bi bj bk bl bm bn bo bp bq br bs bt bu bv bw bx by bz ca cb cc cd ce cf cg ch ci cj ck cl cm cn co cp cq cr cs ct cu cv cw cx cy cz da db dc dd de df dg dh di dj dk dl dm dn do dp dq dr ds dt du dv dw dx dy dz ea eb ec ed ee ef eg eh ei ej ek el em en eo ep eq er es et eu ev ew ex ey ez fa fb fc fd fe ff fg fh fi fj fk fl fm fn fo fp fq fr fs ft fu fv fw fx fy fz ga gb gc gd ge gf gg gh gi "声優さん出演リスト 個別表示：花澤香菜(Kana Hanazawa)" [Voice actor's appearance list individual display: Kana Hanazawa]. Voice Artist Database (in Japanese). GamePlaza-HARUKA-. April 6, 2016. Retrieved May 5, 2016. ^ a b c d e f g h i j k l m n o p q r s t u v w x y z aa ab ac ad ae af ag ah ai aj ak al am an ao ap aq ar as at au av aw ax ay az ba Doi, Hitoshi (May 5, 2016). "Hanazawa Kana roles". Hitoshi Doi's Seiyuu Database. Retrieved May 5, 2016. ^ "Crunchyroll Adds Sketchbook ~full color'S~ Anime (Updated)". Anime News Network. September 17, 2009. Retrieved May 7, 2016. ^ "TBSアニメーション 「To LOVEる」公式ホームページ" [TBS Animation To Love-Ru Official website – Staff/Cast]. TBS (in Japanese). Japan. Retrieved May 6, 2016. ^ "Ray, Mami Kawada to Sing To Love-Ru -Trouble- Darkness 2nd Themes". Anime News Network. March 31, 2015. Retrieved May 7, 2016. ^ "To Love-Ru Darkness Manga Gets New Original Video Anime DVD". Anime News Network. June 30, 2014. Retrieved May 7, 2016. ^ Foronda, Anthony (July 30, 2015). "Anime Spotlight - To loveru -Darkness 2nd". Anime News Network. Retrieved May 7, 2016. ^ "New Sekirei ~Pure Engagement~ TV Anime Green-Lit". Anime News Network. August 9, 2009. Retrieved May 7, 2016. ^ "Kawamori's Basquash Anime Gets Airdate, Staff, Cast (Update 2)". Anime News Network. December 6, 2008. Retrieved May 7, 2016. ^ スタッフ・キャスト [Staff & cast]. Bakemonogatari official website (in Japanese). Retrieved February 15, 2013. ^ "2nd Monogatari Series Second Season Umaibo Snack Promo Streamed". Anime News Network. March 5, 2014. Retrieved May 7, 2016. ^ "Nisemonogatari TV Anime's 2nd Trailer Streamed". Anime News Network. December 28, 2011. Retrieved May 7, 2016. ^ Foronda, Anthony (October 2, 2015). "Anime Spotlight - Owarimonogatari". Anime News Network. Retrieved May 7, 2016. ^ "Sentai Filmworks Adds Clamp's Kobato TV Anime". Anime News Network. May 1, 2011. Retrieved May 7, 2016. ^ a b "Singapore's Anime Festival Asia Announces Guest Lineup". Anime News Network. September 13, 2010. Retrieved May 7, 2016. ^ Foronda, Anthony (December 28, 2015). "Anime Spotlight - Durarara!! x 2 The Third Arc". Anime News Network. Retrieved May 7, 2016. ^ "Cast". Angel Beats! official website (in Japanese). Key. Retrieved November 17, 2014. ^ "Crunchyroll to Simulcast Asobi ni Ikuyo Anime". Anime News Network. July 9, 2010. Retrieved May 7, 2016. ^ "Thriller Restaurant Live-Action/Anime Teaser Streamed". Anime News Network. May 2, 2010. Retrieved May 7, 2016. ^ "Mayo elle Otokonoko 'Boys in Skirts' Anime to Launch". Anime News Network. July 14, 2010. Retrieved May 7, 2016. ^ "Kuragehime BD/DVDs to Add Unaired 'Heroes' Episodes (Updated)". Anime News Network. October 27, 2010. Retrieved May 7, 2016. ^ "Megane na Kanojo, Kara no Kyoukai Promos Streamed (Updated)". Anime News Network. October 20, 2010. Retrieved May 7, 2016. ^ "Infinite Stratos Gets All-New Encore Video on BD/DVD". Anime News Network. June 5, 2011. Retrieved November 17, 2014. ^ "Infinite Stratos Anime's 2nd Season Confirmed With Promo Video". Anime News Network. April 20, 2013. Retrieved May 7, 2016. ^ Uehira, Mitsuru; Bertschy, Zac (June 10, 2011). "Special Event: The Cast and Director of Fractale". Anime News Network. Retrieved May 7, 2016. ^ a b c Manry, Gia (June 20, 2011). "Summer 2011 Anime Season: Directors, Actors, and Themes". Anime News Network. Retrieved May 7, 2016. ^ "Last Steins;Gate IBM Anime Short Posted with English Subtitles". Anime News Network. November 11, 2014. Retrieved May 7, 2016. ^ "Blue Exorcist TV Anime's 1st Promo Video Streamed". Anime News Network. December 18, 2010. Retrieved May 7, 2016. ^ "Blade, Fairy Tail, Ro-Kyu-Bu! Promo Videos Streamed". Anime News Network. June 1, 2011. Retrieved November 17, 2014. ^ "Ro-Kyu-Bu! SS Anime's TV Spot Aired". Anime News Network. June 29, 2013. Retrieved May 7, 2016. ^ "Animated Ro-Kyu-Bu! Promo Video Officially Streamed". Anime News Network. June 11, 2011. Retrieved May 7, 2016. ^ "Kamisama Dolls TV Anime's Promotional Video Streamed". Anime News Network. May 19, 2011. Retrieved May 7, 2016. ^ "Boku wa Tomodachi ga Sukunai Light Novels Get TV Anime (Update 2)". Anime News Network. May 17, 2011. Retrieved November 17, 2014. ^ "Carnival Phantasm's 3rd Season Includes Fate/Prototype". animenewsnetwork.com. Retrieved March 19, 2018. ^ "Aquarion Gets Sōsei no Aquarion Love Crossover Anime & Stage Play". Anime News Network. March 21, 2015. Retrieved May 7, 2016. ^ "Inu × Boku SS TV Anime Slated for January 2012". Anime News Network. August 29, 2011. Retrieved May 7, 2016. ^ "Black Rock Shooter Anime to Be Streamed for Free (Updated)". Anime News Network. March 24, 2010. Retrieved November 17, 2014. ^ "From the New World Novel Gets TV Anime From A-1 Pictures". Anime News Network. February 26, 2012. Retrieved May 7, 2016. ^ "Zetsuen no Tempest TV Anime's 3rd Promo Streamed". Anime News Network. September 15, 2012. Retrieved May 7, 2016. The character section now has designs for Natsumura Kusaribe, and the staff/cast section confirms that Kana Hanazawa is voicing the character Aika Fuwa (in addition to singing the ending theme song "happy endings"). ^ "Zetsuen no Tempest TV Anime's 2nd Promo Streamed". Anime News Network. August 26, 2012. Retrieved May 7, 2016. The website also confirmed that Kana Hanazawa is contributing her song "happy endings" as the anime's ending theme song. ^ "Teekyū Anime Renewed for 7th Season in January". Anime News Network. December 6, 2015. Retrieved May 7, 2016. ^ "Teekyū Anime's Second Season's 1st Promo Streamed". Anime News Network. May 31, 2013. Retrieved May 7, 2016. ^ "Updated Psycho-Pass Promo Video Previews Song". Anime News Network. September 13, 2012. Retrieved May 7, 2016. ^ "Staff&Cast". Sasami-san@Ganbarana official website (in Japanese). Japan: TBS. Retrieved January 14, 2013. ^ "Kotoura-san School Romantic Comedy TV Anime's Teaser Streamed". Anime News Network. November 9, 2012. Retrieved May 7, 2016. ^ "Gonzo Makes Leviathan Moe Fantasy Mobile Game's TV Anime". Anime News Network. March 3, 2013. Retrieved March 4, 2013. ^ "MVM Acquires Watamote It's You Guys Fault I'm Unpopular". Anime News Network. April 17, 2014. Retrieved May 7, 2016. ^ Sevakis, Justin (July 4, 2013). "Anime Spotlight - WATAMOTE". Anime News Network. Retrieved May 7, 2016. ^ "Coppelion Anime Gets 'Reboot' With Previews at Anime Expo, Japan Expo". Anime News Network. July 3, 2013. Retrieved November 17, 2014. ^ "Kana Hanazawa Leads P.A. Works' Nagi no Asu Kara Cast". Anime News Network. September 26, 2012. Retrieved November 17, 2014. ^ Bertschy, Zac (July 14, 2015). "Kana Hanazawa - Interview: The Cast and Crew of A Lull in the Sea - Anime News Network". Anime News Network. Retrieved May 6, 2016. ^ "'Wanna Be the Strongest in the World' Female Wrestling Anime's 1st Animated Promo Streamed". Anime News Network. August 7, 2013. Retrieved May 7, 2016. ^ "Kana Asumi, Nobuhiko Okamoto Join Unbreakable Machine-Doll Anime". Anime News Network. May 17, 2013. Retrieved May 7, 2016. ^ "Tokyo Raven Anime's 2nd Promo Streamed". Anime News Network. September 30, 2013. Retrieved November 17, 2014. ^ "Sunrise Makes January Robot TV Anime Buddy Complex". Anime News Network. December 1, 2013. Retrieved May 7, 2016. ^ Foronda, Anthony (December 23, 2013). "Anime Spotlight - Buddy Complex". Anime News Network. Retrieved May 7, 2016. ^ "Tonari no Seki-kun's New Promo Videos Bring Back Robot Family". Anime News Network. December 13, 2013. Retrieved May 7, 2016. ^ "Kana Hanazawa, Hiro Shimono Lead Tonari no Seki-kun Cast". Anime News Network. October 2, 2013. Retrieved May 7, 2016. ^ "D-Fragments TV Anime's Staff, Cast Unveiled". Anime News Network. October 25, 2013. Retrieved May 7, 2016. ^ Foronda, Anthony (January 1, 2014). "Anime Spotlight - D-Fragments". Anime News Network. Retrieved May 7, 2016. ^ Wake Up Girls PR [@wakeupgirls_PR] (November 29, 2013). "【お知らせ②】追加キャスト決定！アンナ CV:花澤香菜、カリーナ　CV:戸松遥。Wake Up, Girls！の優しい先輩役です！I-1クラブに追加して、脇を固める豪華声優陣でお届けします！アフレコ始まってますよ！ #WUG_JP" (Tweet) (in Japanese). Retrieved December 3, 2013 – via Twitter. ^ Green, Scott (August 22, 2013). "Nisekoi Anime Slated For January 2014". Crunchyroll. Retrieved March 19, 2014. ^ "Kana Asumi Joins Nisekoi Anime's Cast". Anime News Network. October 2, 2013. Retrieved May 7, 2016. ^ "Pokémon Omega Ruby & Alpha Sapphire Anime Short English-Dubbed". Anime News Network. November 20, 2014. Retrieved May 7, 2016. ^ "Misaki Kuno, Natsuki Hanae Star in World Conquest Anime". Anime News Network. December 7, 2013. Retrieved May 7, 2016. ^ "Crunchyroll to Stream The Kawai Complex Guide to Manors and Hostel Behavior". Anime News Network. April 4, 2014. Retrieved May 7, 2016. ^ "Kana Hanazawa, Mai Nakahara, Saki Ogasawara Confirmed for Irregular at Magic High School Cast". Anime News Network. February 27, 2014. Retrieved May 7, 2016. ^ "Broken Blade Films Updated for TV With Spinoff OVA in the Works". Anime News Network. February 2, 2014. Retrieved May 7, 2016. ^ "Kanojo ga Flag o Oraretara Anime's 4th Promo Highlights Megumu". Anime News Network. March 14, 2014. Retrieved May 6, 2016. ^ "Ryota Ohsaka, Kana Asumi Lead Kanojo ga Flag o Oraretara Anime's Cast". Anime News Network. November 29, 2013. Retrieved May 7, 2016. ^ "Nanana's Buried Treasure Anime's New Promo, Supporting Cast Unveiled". Anime News Network. February 6, 2014. Retrieved May 7, 2016. ^ "Mekaku City Actors' 1st Ad Highlights Kana Asumi's Ene". Anime News Network. January 25, 2014. Retrieved February 13, 2014. ^ "Funimation Acquires Tokyo Ghoul, Street Fighter: Assassin's Fist". Anime News Network. July 8, 2014. Retrieved April 25, 2015. ^ "Persona 4 Golden Gets TV Anime by A-1 Pictures in July". Anime News Network. May 2, 2014. Retrieved May 7, 2016. ^ "Tomoaki Maeno, Masakazu Morita, Kana Hanazawa Join World Trigger Cast". Anime News Network. August 20, 2014. ^ "Animax Asia Will Simulcast Parasyte -the maxim- TV Anime". Anime News Network. October 4, 2014. Retrieved May 7, 2016. ^ Foronda, Anthony (December 31, 2014). "Anime Spotlight - Unlimited Fafnir (Juoumujin no Fafnir)". Anime News Network. Retrieved May 7, 2016. ^ "Maria the Virgin Witch Anime Unveils Video, More Cast, Theme Songs". Anime News Network. November 30, 2014. Retrieved May 7, 2016. ^ "Yamada-kun & the Seven Witches Anime Casts Jun Fukuyama, Kana Hanazawa". Anime News Network. December 8, 2014. Retrieved May 7, 2016. ^ "Kana Hanazawa, Ai Kayano, Ryohei Kimura Lead Jōkamachi no Dandelion Anime's Cast". Anime News Network. May 1, 2015. Retrieved May 7, 2016. ^ Foronda, Anthony (August 3, 2015). "Anime Spotlight - Castle Town Dandelion". Anime News Network. Retrieved May 7, 2016. ^ "Ushio & Tora TV Anime Casts Megumi Han". Anime News Network. June 28, 2015. Retrieved May 7, 2016. ^ "Kaori Ishihara, Kana Hanazawa, Yuichiro Umehara Join Gatchaman Crowds insight Anime's Cast". Anime News Network. May 7, 2015. Retrieved May 6, 2016. ^ "Prison School Anime's Cast, Staff, Songs, Video, Designs Unveiled". Anime News Network. May 27, 2015. Retrieved November 3, 2015. ^ "Kana Hanazawa Inspires High Schoolers in 4°C's 'Turnover' Anime Short" (Press release). AnimeNewsNetwork. March 18, 2015. Retrieved March 25, 2015. ^ Foronda, Anthony (January 13, 2016). "Anime Spotlight - Prince of Stride Alternative". Anime News Network. Retrieved May 7, 2016. ^ a b "Shōjo-tachi wa Kōya o Mezasu Anime's TV Ad Highlights Teruha Andō". Anime News Network. December 26, 2015. Retrieved May 7, 2016. ^ Foronda, Anthony (December 22, 2015). "Anime Spotlight - Girls aim for the Wilderness ~ Girls Beyond the Youth KOYA ~". Anime News Network. Retrieved May 7, 2016. ^ Green, Scott (November 24, 2015). "KanaHana Joins "Fairy Tail Zero" Anime Cast". Crunchyroll. Retrieved November 25, 2015. ^ "Fairy Tail Zero Prequel TV Anime Casts Kana Hanazawa as Zera". Anime News Network. November 24, 2015. Retrieved May 7, 2016. ^ "Ange Vierge Anime's Silver Link Studio, 2016 Debut, Visuals Unveiled". Anime News Network. December 6, 2015. Retrieved May 7, 2016. ^ "I.G, Point Pictures Animate Ange Vierge Cards' Promo Video". Anime News Network. August 16, 2013. Retrieved May 7, 2016. ^ "Makoto Shinkai's She & Her Cat TV Anime Previewed in Promo Video". Anime News Network. February 28, 2016. Retrieved May 6, 2016. ^ "「彼女と彼女の猫 -Everything Flows-」". Kanoneko official website (in Japanese). Japan. Retrieved May 6, 2016. ^ "Orange TV Anime's 1st Promo Video Introduces Main Female Cast". Anime News Network. Retrieved March 26, 2016. ^ "Danganronpa 3 Anime Adds Kana Hanazawa as Chiaki Nanami". Anime News Network. 2016-07-04. Archived from the original on 2016-07-04. Retrieved 2016-07-04. ^ "March comes in like a lion TV Anime's Cast, October Premiere Revealed". Anime News Network. 2016-07-21. Retrieved 2016-07-21. ^ "Poco's Udon World Anime Reveals More Cast, Ending Theme Artist, October 8 Premiere". Anime News Network. Retrieved August 20, 2016. ^ "Shūmatsu no Izetta Anime's 4th Promo Video Reveals Staff, Cast". Anime News Network. Retrieved September 2, 2016. ^ "『文スト』第12話、新キャラの声優は花澤香菜さんに決定 | アニメイトタイムズ". Animate Times (in Japanese). Retrieved June 24, 2016. ^ "花とゆめ18号、ヨナ最新21巻発売中！". 草凪みずほのNG Life. Retrieved 2016-10-02. ^ "Square Enix's Schoolgirl Strikers Game App Gets TV Anime by J.C. Staff". animenewsnetwork.com. Retrieved February 14, 2017. ^ "Food Wars! Original Anime DVD Casts More Council of Ten Members". Anime News Network. Retrieved March 15, 2017. ^ "Gabriel Dropout Anime About a Lazy Angel Reveals Main Cast in 1st Promo Video". Anime News Network. Retrieved August 12, 2016. ^ "Sakurada Reset Anime Casts Kaito Ishikawa, Kana Hanazawa, Aoi Yūki". Anime News Network. Retrieved December 19, 2016. ^ "Tenshi no 3P!/Here Comes the Three Angels Anime Reveals Video, More of Cast, July 10 Debut". Anime News Network. Retrieved June 5, 2017. ^ "Tsuredure Children Anime Casts Kentarō Kumagai, Haruka Miyage, Kana Hanazawa". Anime News Network. Retrieved June 12, 2017. ^ "Koi to Uso Anime Casts Kana Hanazawa". Anime News Network. Retrieved June 12, 2017. ^ "Love and Lies Anime's 2nd Trailer Briefly Posted With Cast, July 3 Debut Date". Anime News Network. Retrieved May 14, 2017. ^ "STAFF&CAST". TVアニメ「アニメガタリズ」公式サイト. Retrieved 2017-08-19. ^ "A Place Further Than the Universe Reveals Video, Character Designs, Cast, Staff". Anime News Network. November 8, 2017. Retrieved November 8, 2017. ^ "Jūshinki Pandora TV Anime Casts Kana Hanazawa, Reveals Visual". Anime News Network. November 27, 2017. Retrieved December 27, 2017. ^ "Layton Games Get Spring TV Anime Starring Professor's Daughter". animenewsnetwork.com. Retrieved March 19, 2018. ^ "Cells at Work! TV Anime Stars Tomoaki Maeno, Kana Hanazawa". Anime News Network. January 25, 2018. Retrieved January 25, 2018. ^ "Major 2nd Anime Casts Kana Hanazawa, Natsumi Takamori, Yuko Sasamoto". Anime News Network. February 6, 2018. Retrieved February 13, 2018. ^ "CAST&STAFF". TVアニメ「BEATLESS ビートレス」公式サイト. Retrieved 2017-12-09. ^ "Happy Elements Unveils Original Phantom in the Twilight Anime". Anime News Network. Retrieved March 25, 2018. ^ "STEINS;GATE 0". Anime News Network. April 4, 2018. ^ "Happy Sugar Life Anime Casts Natsuki Hanae, Aya Suzaki, Yuichiro Umehara". Anime News Network. April 20, 2018. ^ "Boogiepop and Others Anime's 2nd Promo Video Reveals 14 More Cast Members, January 4 Debut". Anime News Network. November 30, 2018. Retrieved November 30, 2018. ^ "The Quintessential Quintuplets Anime Reveals Visual, Cast, Staff". Anime News Network. October 19, 2018. Retrieved October 19, 2018. ^ "Senryū Shōjo Manga Gets Spring 2019 TV Anime With Kana Hanazawa". Anime News Network. December 5, 2018. Retrieved December 5, 2018. ^ "Mix Baseball Anime Casts Kana Hanazawa". Anime News Network. February 11, 2019. Retrieved February 11, 2019. ^ "Shōmetsu Toshi Smartphone Game Gets TV Anime at Madhouse (Updated)". Anime News Network. May 27, 2018. Retrieved May 27, 2018. ^ "Cencoroll Film's Ad Streamed for August 22 Opening". Anime News Network. July 9, 2009. Retrieved May 7, 2016. ^ "Romeo Tanaka's Aura Anime Film's Full Trailer Streamed". Anime News Network. March 4, 2013. Retrieved May 7, 2016. ^ "Makoto Shinkai's The Garden of Words Film's 1st 5 Minutes Aired". Anime News Network. May 11, 2013. Retrieved May 7, 2016. ^ Shinkai, M.; Hanazawa, Kana; Irino, Miyu (2013). "Director and Cast Interview (long ver.)". The Garden of Words (Blu-ray) (in Japanese and English). Sentai Filmworks. ASIN B00CJ7Y19I. ^ Funimation Films. "Psycho-Pass: The Movie : Funimation Films". Funimation Films. Retrieved March 28, 2016. ^ "Psycho-Pass Film's Full Trailer, Story, More of Cast Unveiled". Anime News Network. November 27, 2014. Retrieved May 7, 2016. ^ "The Empire of Corpses Film's Web-Only Final Promo Video Posted". Anime News Network. September 19, 2015. Retrieved May 7, 2016. ^ "Go! Princess Precure!!! Film Casts Kana Hanazawa". Anime News Network. September 18, 2015. Retrieved May 6, 2016. ^ "Yu-Gi-Oh! : The Dark Side of Dimensions Film Casts Kana Hanazawa, Satoshi Hino". Anime News Network. December 8, 2015. Retrieved May 6, 2016. ^ "映画『君の名は。』新海誠監督インタビュー！". animatetimes. August 30, 2016. Retrieved September 2, 2016. ^ "ORANGE -FUTURE- New Anime Film Info and Images from Toho". scifijapan.com. November 18, 2016. Retrieved January 24, 2017. ^ "Blame! Film's Full Trailer Reveals May 20 Opening, Cast, Song Artists". Anime News Network. Retrieved February 23, 2017. ^ "Irregular at Magic High School Anime Film Reveals New Promo Video, More Cast, Theme Song Artist, New Visual". Anime News Network. March 11, 2017. Retrieved March 11, 2017. ^ "松たか子、広瀬すずの母親に！花澤香菜＆梶裕貴らも出演『打ち上げ花火』". cinemacafe.net. Retrieved June 12, 2017. ^ "Gen Urobuchi's Godzilla Anime Film Reveals 6 Main Cast Members, Concept Art Image". Anime News Network. January 19, 2017. Retrieved January 27, 2017. ^ "若おかみは小学生！". eiga.com. Retrieved October 13, 2018. ^ "2 Cencoroll Films Get Joint Theatrical Screenings on June 29". Anime News Network. March 20, 2019. Retrieved March 21, 2019. ^ "Sci-Fi Naval Anime Arpeggio of Blue Steel's 2nd Promo Streamed". Anime News Network. July 12, 2013. Retrieved May 7, 2016. ^ "D-Fragments School Game Club Manga's TV Anime Listed". Anime News Network. August 6, 2013. Retrieved May 7, 2016. ^ "Junko's Watashi ga Motete Dousunda Manga Gets Drama CD". Anime News Network. September 8, 2014. Retrieved May 7, 2016. ^ "Nemesis, Mikan Join To Love-Ru Darkness Game". Anime News Network. April 28, 2014. Retrieved May 7, 2016. ^ "テイルズ オブ グレイセス ポータルサイト" [Tales of Graces Official site] (in Japanese). Namco Bandai Games. ^ "Characters" (in Japanese). Key. Retrieved November 17, 2014. ^ "Date A Live PS3 Game Slated for Summer". Anime News Network. Retrieved May 7, 2016. ^ "Magi: Aratanaru Sekai 3DS Game's Promo Streamed". Anime News Network. September 24, 2013. Retrieved May 7, 2016. ^ "イベント「神境にて辿る跡」開催・小説発売・TVCM放送開始のお知らせ" (in Japanese). December 26, 2014. Retrieved September 26, 2018. ^ "『テイルズ オブ アスタリア』×『グランブルーファンタジー』コラボレーションイベント開催！" (in Japanese). July 13, 2015. Retrieved September 26, 2018. ^ "Liberation Maiden SIN Visual Novel's 1st Promo Streamed". Anime News Network. September 13, 2013. Retrieved May 7, 2016. ^ "Guild01 official website, Liberation Maiden info (JP)". October 6, 2012. ^ "Bandai Namco Games Unveils Tales of the World: Reve Unitia 3DS Game's Promo". Anime News Network. May 31, 2014. Retrieved May 7, 2016. ^ "5 Ro-kyu-bu! Players Appear in Dengeki Bunko Fighting Climax Game". Anime News Network. January 29, 2014. Retrieved May 7, 2016. ^ "Durarara!! Gets New PS Vita Game in 3D in January". Anime News Network. August 7, 2014. Retrieved May 7, 2016. ^ Romano, Sal (November 13, 2014). "Dragon Quest Heroes reveals Jessica, Yangus, Bianca, and Nera voice actors". Gematsu. ^ "Rodea the Sky Soldier Wii U/3DS Game's 1st Gameplay Video Streamed". Anime News Network. February 13, 2015. Retrieved May 7, 2016. ^ "Meiji-Era Ace Attorney Game's TGS Video Posted". Anime News Network. September 18, 2014. Retrieved May 7, 2016. ^ "Persona 4: Dancing All Night Game Videos Confirm Marie, Adachi DLC". Anime News Network. June 23, 2015. Retrieved May 7, 2016. ^ "More Titles Announced for AnimeLab Winter Season". Anime News Network. January 12, 2016. Retrieved May 7, 2016. ^ "Japanese Mobile Game Giant gumi Inc. Releases "Elysium"—a Companion Piece to the Main Phantom of the Kill Story". Gamasutra. gumi.Inc. 10 August 2017. Retrieved 23 January 2018. ^ "Full Cast List for Kingdom Hearts Back Cover revealed". KHInsider. Event occurs at Click source YouTube video for cut scenes and Japanese credits which show Kana Hanazawa's name for Invi. Retrieved June 3, 2017. ^ "Shoujo Byou's Anime Music Video DVD Confirmed". Anime News Network. October 20, 2009. Retrieved May 7, 2016. ^ "Project Itoh's Harmony Anime Film Previewed in Video". Anime News Network. October 30, 2014. Retrieved May 7, 2016. ^ "登場人物". NHK. Archived from the original on July 30, 2017. Retrieved May 12, 2017. ^ "宮野真守、朴ろ美、花澤香菜、玄田哲章！ティム・バートン監督最新作「ミス・ペレグリン」声優発表 : 映画ニュース - 映画.com". eiga.com. Retrieved February 14, 2017. ^ "梅原裕一郎＆大塚明夫、2人1役に！『僕のワンダフル・ライフ』吹替声優決定". cinemacafe. Retrieved August 11, 2017. ^ "Japan's Animation Blu-ray Disc Ranking, July 29-August 4". Anime News Network. August 6, 2013. Retrieved May 7, 2016. ^ "Go! Go! Kaden Danshi Gets Anime/Live-Action Film With Kana Hanazawa". Anime News Network. February 15, 2014. Retrieved May 6, 2016. ^ "人気声優・花澤香菜　高校生以来のドラマ出演「得意なところを出せた」". Tokyo Sports. Retrieved January 24, 2018. ^ "花澤香菜のアルバム作品" [Kana Hanazawa Album Sales Ranking]. Oricon (in Japanese). Retrieved February 25, 2018. ^ "「Blue Avenue」 花澤香菜│オリコン芸能人事典-ORICON STYLE" (in Japanese). Oricon. Retrieved August 13, 2015. ^ "「Opportunity」 花澤香菜│オリコン芸能人事典-ORICON STYLE" (in Japanese). Oricon. Retrieved February 27, 2017. ^ "花澤香菜のシングル売上ランキング" [Kana Hanazawa Single Sales Ranking]. Oricon (in Japanese). Retrieved February 25, 2018. ^ "Kana Hanazawa | Chart History". Billboard. Retrieved September 25, 2018. ^ a b "Japanese Music: Top Japanese Songs Chart". Billboard. Retrieved 2018-12-22. ^ "Japanese Music: Top Japanese Songs Chart". Billboard. August 4, 2012. Retrieved September 25, 2018. ^ "Japanese Music: Top Japanese Songs Chart". Billboard. November 10, 2012. Retrieved September 25, 2018. ^ "Japanese Music: Top Japanese Songs Chart". Billboard. February 2, 2013. Retrieved September 25, 2018. ^ "Japanese Music: Top Japanese Songs Chart". Billboard. January 18, 2014. Retrieved September 25, 2018. ^ "Japanese Music: Top Japanese Songs Chart". Billboard. October 18, 2014. Retrieved September 25, 2018. ^ "Japanese Music: Top Japanese Songs Chart". Billboard. January 17, 2015. Retrieved September 25, 2018. ^ "Japanese Music: Top Japanese Songs Chart". Billboard. March 14, 2015. Retrieved September 25, 2018. ^ "Japanese Music: Top Japanese Songs Chart". Billboard. March 12, 2016. Retrieved September 25, 2018. ^ "Japanese Music: Top Japanese Songs Chart". Billboard. June 18, 2016. Retrieved September 25, 2018. ^ "Japanese Music: Top Japanese Songs Chart". Billboard. December 17, 2016. Retrieved September 25, 2018. ^ Loo, Egan (October 7, 2017). "'Fate/Apocrypha', 'Sword Art Online' Movie win Top Newtype Anime Awards". Anime News Network. Retrieved October 14, 2018. ^ Loo, Egan (October 7, 2018). "'Idolm@ster SideM', 'Bungo Stray Dogs' film win Top Newtype Anime Awards". Anime News Network. Retrieved October 14, 2018.